…I dig up early reviews and articles that I inadvertently left behind somewhere along the road between the late-1990s and today. Sometimes I never got around to reformatting them for a new version of the site. Sometimes I took them down because they were in dire need of editing or proofreading. Whatever the case, here they come. The design of LookingCloser.org isn’t the only thing that has changed since the late ’90s. The writer has changed, too. So I may interrupt the text of these early reviews with updated commentary or corrections as I encounter—and argue with—earlier versions of myself. …with a series that made me feel out of step with my generation. Almost everyone around me loved The Matrix, and then they seemed disappointed by the sequels. But I was in the other lane, heading in the opposite direction. 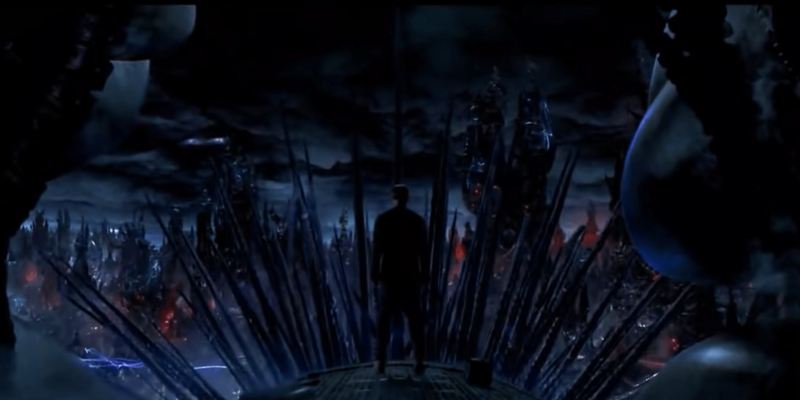 Frustrated by the original, and far more excited about other sci-fi films playing in theaters nearby, I didn’t get excited about this epic saga until its closing chapter, The Matrix Revolutions. Why? Well, the reviews will explain. In the future, human beings are little more than batteries that power machines, machines that have conquered the world. “Living” in suspended animation, people are entertained by a false reality transmitted into their brain by the “Matrix” so they will relax and keep pumping out the power. But the machines have a problem: A few have escaped this illusion-world and are forming a rebellion against the Matrix. Now, I’ve got nothing against mythological archetypes. I love it when a formula is fulfilled with imagination and innovation. My deepening love for cinema does not threaten to spoil my enjoyment of action or sci-fi. But I’m increasingly impatient with movies that aim no higher than to entertain eyeballs. It seems like a rare event that a filmmaker delivers a genre movie that rewards attention, reflection, and discussion. Action thrillers like Die Hard and Face/Off, ponderous serialized space-fantasy like Star Wars, and dark sci-fi parables like Blade Runner and Existenz are among my favorite films, rewarding revisitation regularly. 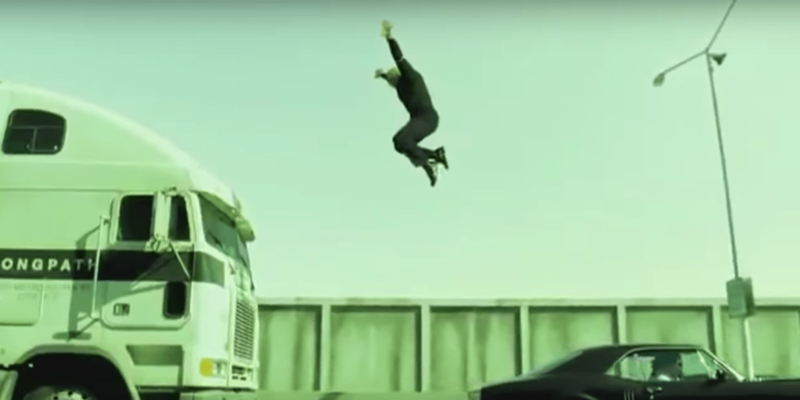 Where does The Matrix rank in this, uh, matrix of genre movies? Between bursts of slick, stylish action, it raises some interesting questions about where society is headed. (Are becoming mere generators, consumers dutifully sustaining their conquerors—the corporations?) But it provides only action-figure mannequins to play out the story, and it digs no deeper than Stoner Philosophy 101. It can’t decide whether it’s a tongue-in-cheek action adventure or a soul-searching sci-fi epic. And it does not strike a satisfying balance. Last year, we saw two films—Dark City and The Truman Show—that were about fabricated worlds in which a hero tries to make sense of all that is artificial and learns how to overcome it. There are allegorical implications in each. But both of those films outshine The Matrix in almost every way. Dark City director Alex Proyas and The Truman Show‘s Peter Weir actually let their actors do some acting. Proyas also knew how to tell a complicated story and address serious philosophical questions without giving up his relentless (and astonishing) pace. I knew that I had paid to see an action movie, but The Matrix kept raising questions that made me want it to be so much more. For example, if these revolutionaries have been waiting for years for “the One” who would be their savior, I want to know what is special about the One—why he’s so unique, what he can do that’s superior to any of the rest of them. Surely he can boast of better things than merely fighting harder and faster than them. Surely! Keanu Reeves, who became famous by feigning (?) dull-wittedness in the Bill and Ted movies and then aspired to more serious acting (My Own Private Idaho, Much Ado About Nothing, Devil’s Advocate) seems to have surrendered to his fate — he’s an action figure. As Thomas Anderson—or “Neo”, the long-awaited Messiah of cyberspace—he just looks angst-ridden, incapable of inspiring anyone to welcome him into Jerusalem with palm branches. If anybody has a chance to act in this film, it’s the great Laurence Fishburne. Fishburne has demonstrated his ability before in films like Searching for Bobby Fischer and Deep Cover Unfortunately, he blows his opportunity here for a defining role. Morpheus, a mysterious renegade Yoda who endures to train the Savior and see the world freed of the curse of the machines, could have been a fascinating stranger. Instead, he’s expressionless (unless a toothy half-grin makes one expressive), and he makes every line sound like a pronouncement of historic gravity spoken from a pulpit. Worse, Morpheus’s declarations of the “truth” to Neo are so condescendingly pretentious that if I were Neo I’d have laughed at him. These “teachings” are meant to inspire respect and awe, but they’re so lacking in substance that they just become annoying. For an interesting comparison, see Mystery Men, which is also in theaters this year: There’s a movie that sees the comic potential in a figure like Morpheus—in that case, he’s The Sphinx. After Yoda taught Luke Skywalker, there was still a lot of movie left for Skywalker to put his education to work. But there’s no story left by the time Keanu is finished. There’s only room for a big gunfight. And just as the credits are about to roll, The Matrix makes the same blunder that blunts the ending of 1999’s grander sci-fi spectacle, The Fifth Element. As the buzzer is about to sound, the movie decides to announce that True Love—out of the blue—is the solution to all ills. Remember how, after two hours of blowing things up, “true love” just seemed a jarring and unearned conclusion to The Fifth Element? Same thing here. True love develops so suddenly between two characters in The Matrix that it scared the daylights out of me. I’d watched the development of an anti-gravity kung-fu partnership, and I might have detected a faint pulse of hormones in these mannequins — but love? When does anybody in this movie have time to fall in love? 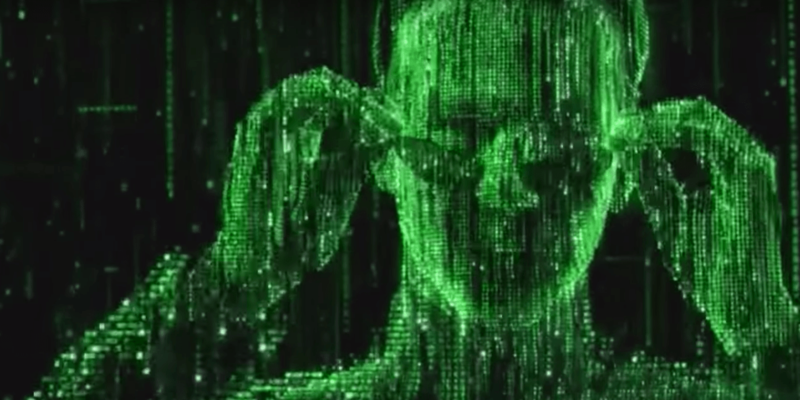 The guy that sat next to me shook his head and said, “You know, now that they finally explained the Matrix world, they’ve set up a context for a cool story!” I think he’s right. Maybe the sequels will fulfill the promise that the first hour of The Matrix gave us. 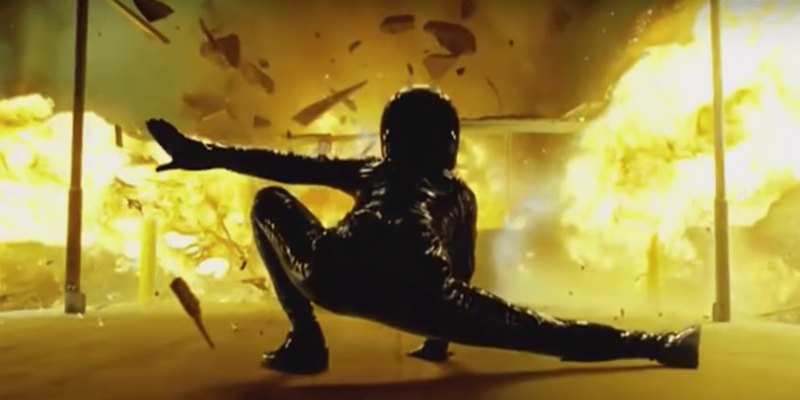 Maybe there is more to Neo than meets the eye in this film. Maybe he’s got more than fast hands. Firstly, I don’t think Neo is a Christ figure. Morpheus explains that there was a man, who trained him, and the oracle predicted his return: a rebirth, not a birth, and thus a Buddha, not a messiah. Therefore, all Jeffrey’s complaints about how Morpheus trains Neo has to do with a misinterpretation of theme: this movie is an amalgam of Western concepts of the reproduction of power and Eastern methods of escaping it. Think Zen, and all those “are you ready,” “when you’re ready” comments make sense. It’s not that you have to bend the spoon; that’s impossible. You just have to recognize that the spoon doesn’t exist. And so in an Althusserian (Marxist critic of power structures) world where every individual has been interpolated into a false consciousness—where every individual, no matter how enslaved can be your enemy because he or she is so attached to the dream that they’ll die to protect it—the only way to combat such ingrained belief is not to believe at all. Enter postmodernism. As for the movie’s emphasis on “guns, lots of guns”: the question is… Can you tear down the master’s house with the master’s tools? My take on this is: a little bit. The shoot out was remarkably well done, but what saves the day is not more guns, but rethinking, or more correctly, not thinking clearly. Which is why Keanu Reeves is the perfect man for the job. He’s so “not there”, and not being there is exactly what’s needed. The kid in the Buddhist get-up is too serious for the job; he’s thinking East, but can’t live West. Keanu attempts to blend East-West into, well, into disbelief; so the Kung-fu is only effective to a point. In America, you need a gun to win the day, or at least start the day off right. The final scenes of the movie literalize America’s motto: “Make my day.” The ultimate promise is not for a post-trib millennium, but to destroy the false-consciousness which enslaves humanity. It’s postcolonial, oppositional theory based in an Althussarian world-view plus Zen postmodernism. And that’s why it’s not supposed to feel finished, or polished, or profound. The kiss, by the way, is a spoof. You’re supposed to groan. Didn’t we all groan when they ran off into the sunset? The effective part though is that the backdrop for this kiss is not the beautiful west, but the ugly reality. It turns out that Plato’s Cave of Western Philosophy is just a dream, and once you get outside, the reality is pretty darn ugly. Question is, would you go back in for the steak? If you’re looking for a moral to the story, it’s this: America is a fantasy, and people are enslaved in not-so-pleasant circumstances to serve as the labor (battery) to keep our dream alive. We think we’re more free than Indonesians, but it’s all just a corporate nightmare, and once you realize that, will you abandon the fantasy, or ask for another steak? So that’s why I think Mr. Overstreet is wrong about The Matrix. It’s what postmodernism is all about; you need an entirely new critical apparatus to enjoy the entertainment. Drop the Christian motif and the Western attachment to belief (when Neo is “starting to believe” he’s only starting to believe in disbelief), and I think you’ll find a spectacular vision of postmodern oppositional consciousness. P.S. You should note that I’m not a proponent of The Matrix‘s premises, but I like to see any philosophy (or anti-philosophy) well portrayed. So the Gnostic Christ is the Christ who encourages us to follow our impulses (just as Mouse encourages Neo to do; but what if our impulses lead us to kill our fellow humans, as Neo’s do, or even our comrades, as Cypher’s do? ); he is the Christ who encourages us to trash this world, or at least ignore it, because it’s only a distraction anyway. Contrast that with the, for lack of a better word, orthodox Christ, who embraces creation and extols the value of the material world (not least by becoming material, a part of creation, himself), who knows that our very souls need some sort of cleansing that no amount of impulse-following can give us. So perhaps the question we ought to be asking here is whether or not Neo is unique. Yes, there was that other guy who trained Neo’s predecessors, and Neo is, in some sense, a rebirth of that character, but I don’t recall the film making an explicit plug for reincarnation, any more than the gospels argue that John the Baptist was a reincarnation of Elijah. John and Elijah had a lot in common, yes, and John was seen to be a fulfillment of the prophecy that Elijah would return; Neo and his predecessor have a lot in common, and Neo is seen to be a fulfillment of the prophecy that his predecessor would return; the parallels to Christian thought don’t stretch credulity all that much, and there is no need to assume reincarnation there. So … is Neo unique? Does the film put him on a pedestal, or does it suppose that that which Neo has learned is somehow learnable by everyone? On this point, the film is, I think, unclear. 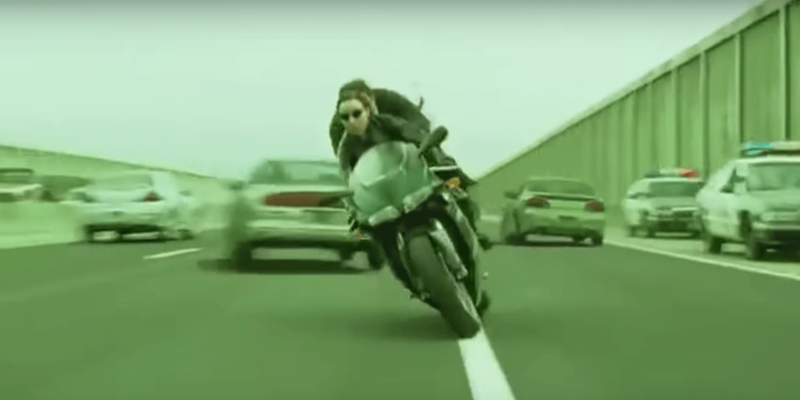 One could argue that, in the end, Neo has become just another rebel like Morpheus or Trinity—somebody who can leap tall buildings in a single bound, yada yada. 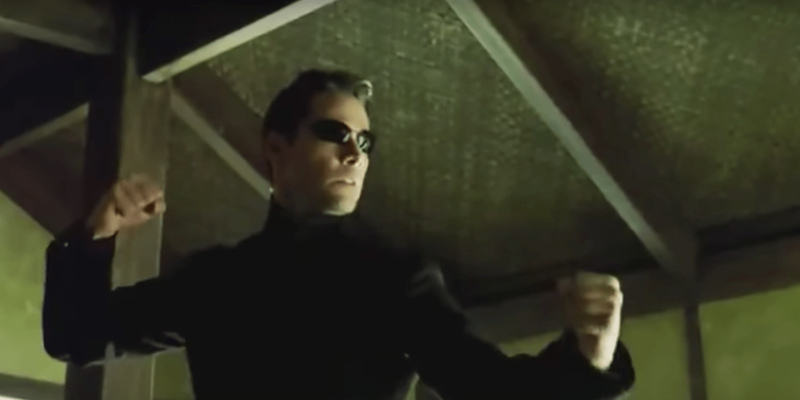 But I suspect that there is more to it than that; Neo, in his moment of glorified resurrection, does something which no other character seems to be able to do, namely, he kills Agent Smith. 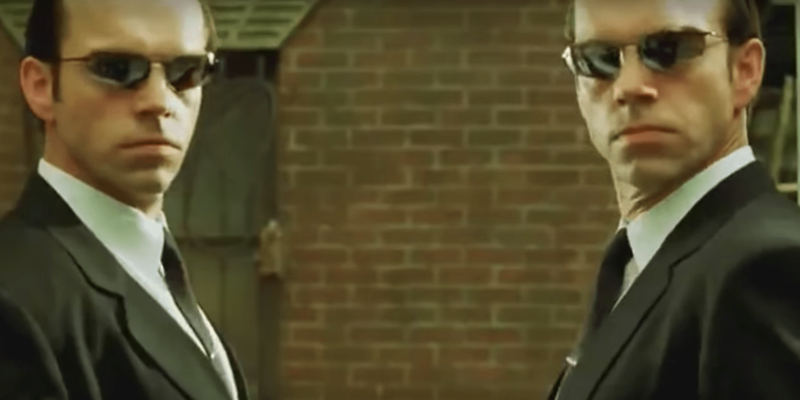 He doesn’t just fight the guy off until he can get an exit, the way that Trinity does at the beginning; nor does he take a good beating, the way that Morpheus does in the third act; he actually sees through the Matrix, sees it for what it is, and enters Agent Smith in order to destroy him from within. He vanquishes the foe in a way that no other character is apparently able to do. And so I tilt towards believing that Neo is, to some extent, unique… and thus a Christ figure, not a Buddha figure. 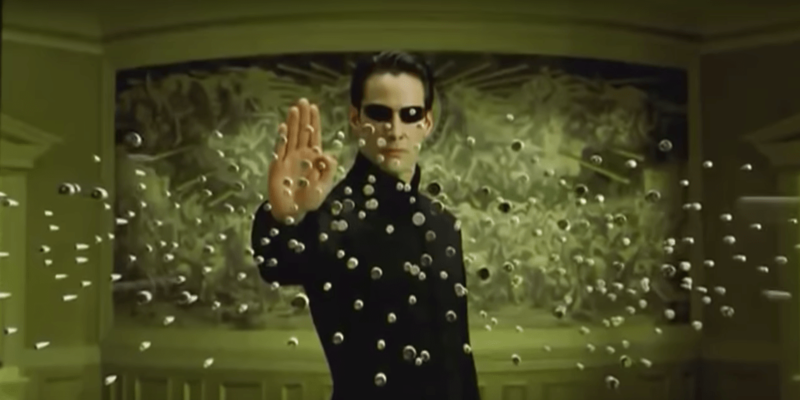 The Matrix Reloaded takes every aspect of 1999’s The Matrix and turns it up to ’11.’ There are more awe-inspiring visuals; more stylish and thrillingly supernatural kung fu that will fry the circuits of the Cool Meter; and more brain-bending ideas about reality, illusion, freewill and determinism. I suspect that the moral of the saga is this: The only true way to live freely as a human being is to disobey, to rebel, against any high power, against any control. (When one of Neo’s adoring followers says, “You saved me!”, Neo insists, “You saved yourself.”) If that is indeed the lesson, then this series cannot come to any satisfying conclusion. As Bob Dylan insists, “You gotta serve somebody.” Human beings are meant to follow a higher power. Their problem is that they keep following the wrong powers—primarily, their own misguided selves. Morpheus, Neo, and Trinity are right to strive against the tyranny of a cruel Architect. But if they conclude that they are alone in their struggle, that there is no benevolent higher power offering a better way, then their only option is slavery to yet another corrupt power: their hearts. Being human, having imperfect appetites, they will veer off any track toward fulfillment. Morpheus can’t have it both ways. He can’t insist on rebellion against higher powers and yet place his hope in having been born for a “purpose,” having been guided by “Providence.” If we indeed have a “purpose” in this life, one worth discovering, one that means something, it must have been purposed by someone. If Providence does exist, then we had better learn some humility and, yes, obedience. All I see in Zion is willfulness, defiance, and pride. Those who mock the Star Wars prequels for flat acting and cheesy dialogue will be dismayed to see that this virus has reached Zion. I would argue that things are worse here. Lucas’s lifeless character interaction at least enriched the storytelling with history, details, some humor, and some mystery. 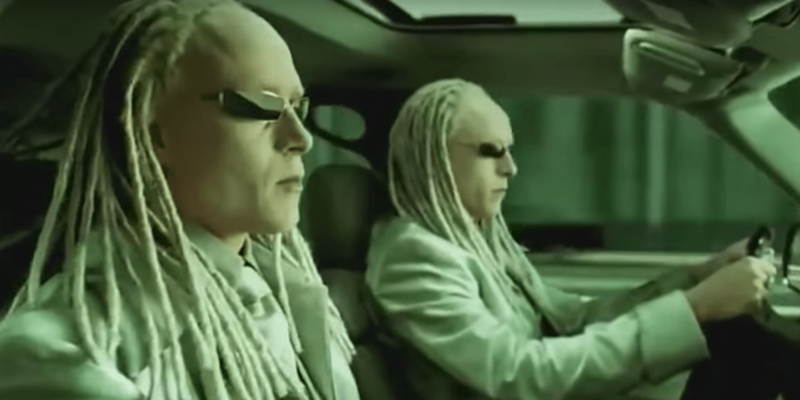 The Wachowskis’ character interaction comes in two flavors: preaching and pummeling. I feel like I’m switching between the Psychic Network and the WWF. You can feel the writers getting desperate for snappy, quotable one-liners at the end of each action sequence. When Neo and the gang finally catch up to a creepy Frenchman called the Merovingian, he turns out to be the film’s most interesting character. He treats them to the one truly unique scene, an exchange infused with personality, humor, and new ideas. It is also short and sweet. Like the memorable Matrix scene when Mr. Smith first interrogated Neo, the thrill of the unpredictable takes over, proving that personality clashes are far more suspenseful that fisticuffs. The film’s most troubling, twisted, and interesting moment–the only moment when the villains seem truly malevolent instead of just violent—comes from something as surprising as the restaurant dessert tray. All of the great middle movies have tried to outdo their predecessors: The Empire Strikes Back, The Wrath of Khan, Terminator 2, The Two Towers, and this year’s spectacular X2: X-Men United. But what I find myself remembering fondly are the character moments, the ways relationships change, the humorous and human developments. The visceral, searing confrontation between Vader and Luke Skywalker; the tragic farewell between Spock and Kirk; the bonding moments between heroic Terminator and fatherless boy; Gollum’s quiet conversation with himself; Magneto revealing the horrifying truth to Xavier in the plastic cell. It is still possible to save this series. The Wachowskis have a lot of loose ends to tie up in Revolutions, but they have also given themselves great opportunities to deepen their characters. Morpheus’s ego and his faith have been dealt a serious blow; how will he respond? Neo is more confused than ever; what will he do? 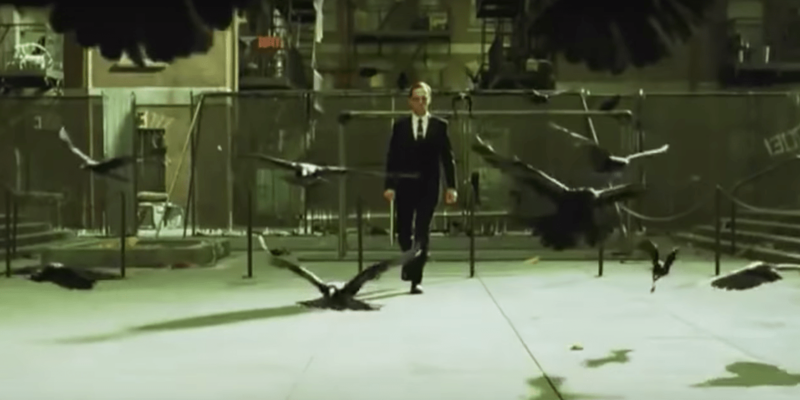 The nature of Agent Smith has changed: What will happen to the way he hates humankind now that he can see them from a different angle? The Matrix saga, as you know, is primarily about the enslavement of humanity to dehumanizing and exploitative machines. (Do they represent technology? Capitalism? Media culture? Sin? Who knows?) And yet, with the arrival of what is allegedly the final chapter, the central dilemma remains unresolved. The machines are neither victorious nor overthrown. 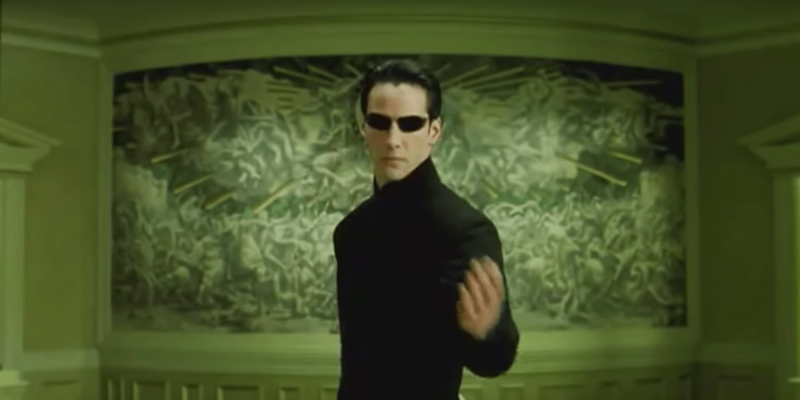 We’re left with many nagging questions about the issues raised early on: What is the Matrix? Who exactly is “The One” and where does his power come from? Is it possible to win the war? Is there a difference between human being and machine? Is there a true religion? While there are many enthusiasts who will be surprised at this chapter’s lack of resolution, what is most surprising is the movie’s avoidance of the things that earned it so many nay-sayers, including myself. 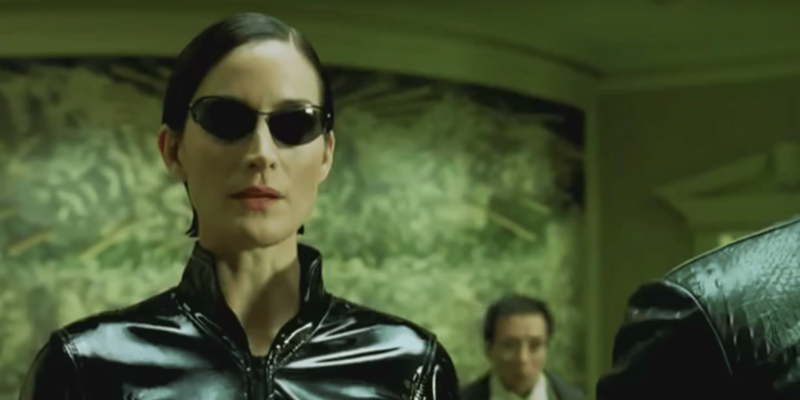 While The Matrix was decent entertainment—a curious hodge-podge of religious ideas and philosophical tangents with a few nifty special effects thrown in for good measure—it never developed engaging characters. Who wants an epic adventure about mannequins in sunglasses? Reloaded was far worse, a bloated affair of overlong, artificial kung-fu fights, tedious and pretentious speeches, and pancake-flat dialogue.